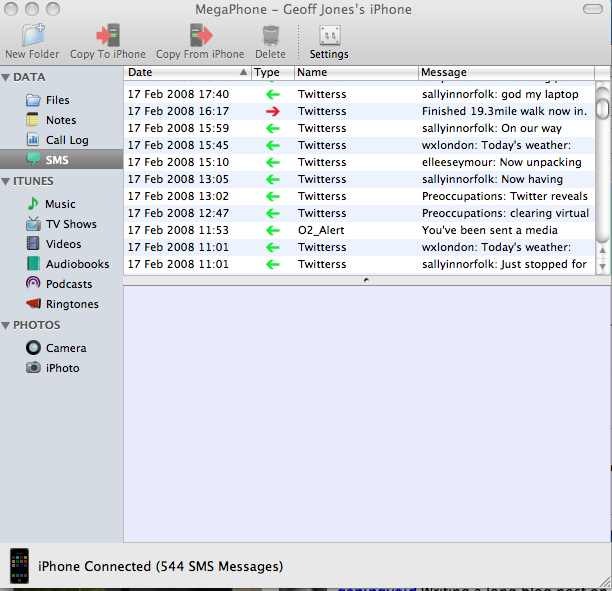 MegaPhone from Ecamm networks is a very neat little application for the Mac and iPhone. You can now store and read all yout sms texts on the MAC as well as storing all your call data. A big plus for us ex Treo users is that at last you can store, create and add memo’s (notes) on the iPhone. Another useful facility is that you can use the iPhone as a memory stick. (As long as you have megaphone on all your computers). On the screenshot you can see that I have kept 544 text messages since I got the phone on the 10th Nov 2007. A very handy bit of software for a tenner.